Dave and I actually enjoy photographing both. However, despite starting out as LEGO photographers, we’ve both gravitated more toward action figure photography since last year’s Oregon Toy Photo Safari. Is that a coincidence? To find out, we dove into our history with both LEGO and action figures, the pros and cons that come with each, and the challenges that come with changing the scale of your subject. What about you? Do you prefer LEGO to action figures, or vice versa? Are you like me and Dave, bouncing from one to the other depending on the photo? Or do you shoot another kind of toy entirely? We’d love to continue the discussion with you in the comment section below! Also, make sure to check out last year’s podcast interview with Dave if you missed it (or just want to re-listen!). There’s still a week left to participate in this month’s themed podcast discussion: Recreating your favorite photo or artwork. We’ll be recording our podcast next Saturday morning, so if you want to join us and get the chance to have your interpretation discussed on the podcast, please have it uploaded or sent to us by this Friday, March 29th. Tag your photos #tp_recreation and tag both myself (@thereeljames23) and Kristina (@kalexanderson). I loke both. Lego figures are easier to set up and I like to tell stories with them. Also they are easier to carry around. Action figures are great for more complex pictures where you need body language or want a realistic look. Yes! I love both as well, and think the choice of toy totally depends on the type of story I’m trying to tell. Sometimes that’s best told through LEGO, other times through action figures. You know what would have been interesting? Talking to a toy photographer who has gone from action figure towards LEGO, not just two guys who’ve moved from LEGO to action figures. Or how about talking to a toy photographer who specializes in LEGO to find out why they’ve stuck with the brand? Especially since there are so many drawbacks to this toy in your opinion. I will give you props for sticking the landing: limitations DO inspire creativity. What about Duplo, Minidolls, Fabuland, Technic figures, Belville, Scala? 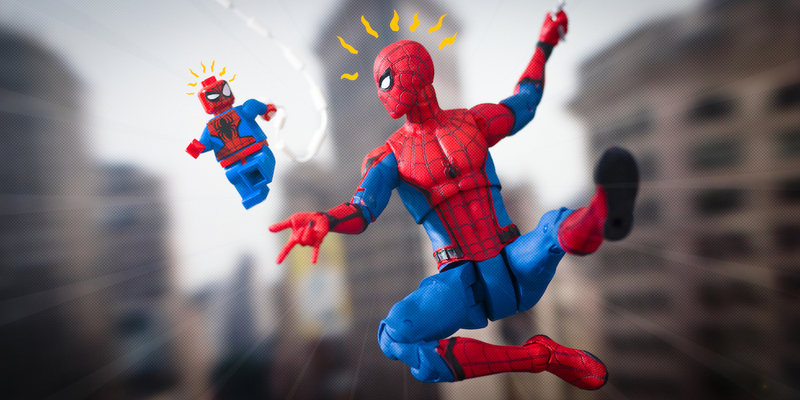 8) “There’s more to learn from people photographing action figures because they have more skill.” Maybe good toy photography isn’t (only) about skill? Some of my favorite toy photographers probably don’t have much skill. But they’ve got a lot of creativity and an inspiring vision. I’d rather learn from them than from the skilled toy photographers. 9) “The world of toy photography is divided into two communities LEGO vs. action figures.” What about dolls, wooden toys, “static” figures, plushies, puppets, rubber ducks, etc? And isn’t “action figure” just a fancy name for men who don’t have enough balls to proudly say “I play with dolls”? Oh wow! I didn’t realize this discussion would kick off such a big debate. I’m sorry to hear that both of you were let down by this episode. I certainly didn’t mean to come across as negative toward LEGO, or to focus the discussion on clichés. I realize now that perhaps this wasn’t the best format for this particular conversation, or that by distilling our thoughts down to simple pros & cons, we ended up merely scratching the surface of these toys’ merits in photography and coming across as negative. I agree 100% with everything said in this episode. I was quite overwhelmed by the variance in brand and quality when I first jumped into doing action figures. So many choices. 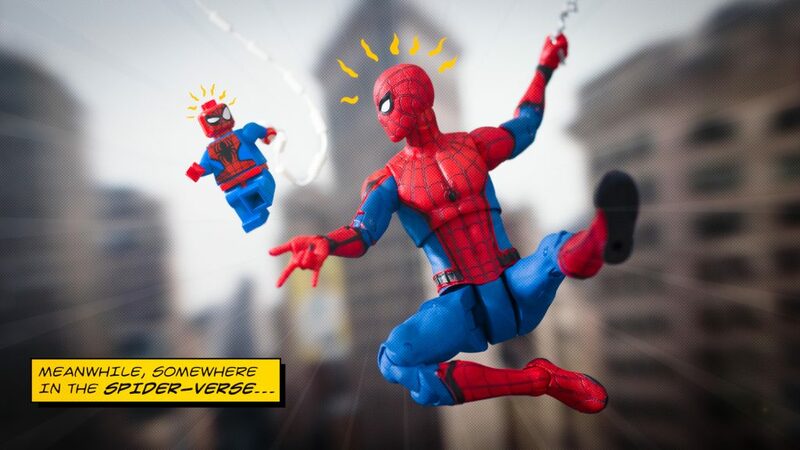 Dave, if you want a super hero landing, you might try these figures: Marvel Legends Miles Morales, SH Figuarts Iron Man MK 50 and the Tamashii Nations Gipsy Avenger. I’ve gotten fairly successful hero landings with all three of those figures. For me, my gateway figure was the ML Miles, mainly because I’m a huge fan of Miles as Spidey. I’ve tried shooting the Black Series K2 and Stormtroopers, but haven’t gotten inspired because they’ve been used by so many people already. Miles is great because he’s a little bit fringe. Thanks Zee! I too love the fringe characters, and agree that it can be hard finding inspiration with a toy everyone else is (over)shooting. The more I work with action figures, the more I’ve begun to look for how I can push myself beyond what other people are doing and spend some time in the fringe myself! But really, if what you’ve said is accurate, this is a disservice to LEGO photographers. I dislike most action figure photography because it bores the hell out of me with the same goal of looking like a still from a CGI movie. Atmosphere Aerosol! Fight pose! Um, yes, very riveting, never mind original. I look forward to hearing your thoughts, Anna! And I apologize if the discussion is indeed a disservice to LEGO photographers. That was never my intention. Hi James and Dave! Great to hear both of you share your personal journeys from LEGO to action figures. For toy photography, I love “action figures” because I’m a wannabe portrait photographer (and since working with real models is beyond me,) detailed head sculpts are the next best thing. I love LEGO for it’s customisability and how I can create my own characters in images. In my opinion, that would be a weakness of “action figures” as most figures tend to be linked to a particular pop culture franchise and creating custom characters are less common/easily available. Thanks Janan! I love that over time you’ve branched out into LEGO as well. Despite shooting more action figures recently, LEGO will always be my favorite toy. It’s exactly for that customizability that you mentioned. I love that with LEGO, the possibilities are endless and the only limit is your imagination. Seriously, many of the issues both James and Dave have encountered shooting LEGO minifigures is really just a matter of knowing their gear better and understanding the subject well enough. For example, it’s not difficult to get the background to blur on *any* subject: LEGO, action figure or human. You just need the knowledge: shoot with the right lens, open up your aperture, and/or find an appropriate camera-to-subject distance and subject-to-background distance. Experienced photographers do this all the time. It’s an essential skill for every portrait photographer, in fact. Practical effects are difficult with LEGO because of debris is flying into your lens? Use a lens with a longer focal length to put a safe distance between your camera and flying dirt! If you’re shooting with a macro lens that has a maximum focusing distance of 2 inches, you’re going to get your lens effed. Also again, your lens choice is probably wrong. Put more distance between your camera and the set with a longer focal length macro lens so more light can fall on your minifig. And modify your light sources better. It is totally doable with snoots, tape, barn doors, grids, etc. As for articulation, scale and whatnot, most of the arguments you guys made against LEGO is because your goal is realism. If the very real snow and very real sand is not scaling well with your LEGO, maybe don’t use real snow and sand. Cornstarch, flour, cocoa powder, etc, should be used if your goal is to more closely resemble reality. Lastly, LEGO has a system: everything must be able to connect at some point to the bricks and plates which is why minifigs of all sizes are designed the way they are. They are only part of a bigger system, not standalone toys like action figures are. Being true to the system means taking liberties with sizes and features of the minifigs. The final point about limitations and creativity is exactly the reason why people stick with one thing. This is true of gear, subjects, location, colors, or whatever. Six years later, I’m still shooting LEGO because there are so many challenges ahead of me still. Sorry this was long for a comment and perhaps terse but there was way too much misinformation presented as fact, not opinion. This is a really interesting discussion. I think it all depends on what every one of us want to achieve while shooting. I started shooting soul of chogokin and masters of the universe, i’m still a collector of both (and many other things like hot toys or SH figuarts) but what i was missing was heavy personalisation. I found it easier to shoot action figures because of the higher number of articulation point, the SH figuarts are amazing from this point of view. I could have them posed exactly how i thought they will be in real life. Unfortunately their size (where could i put them?!?!) mixed with the low personalisation, made me desist until i came back from the dark age and started to shoot LEGO. I found it very challenging and this hit me deeply, i wanted properly shoot LEGO minifigures! Their size is perfect for my storage allowance and the degree of personalisation is infinite. About practical effect and all the rest, i must agree with Anna, i don’t find so many differences between the two types of photography. For sure making rain looks “real” is easier with figures. Harder with LEGO. Extremely hard with N0 scale models! But for me is all part of the fun, higher is the challenge, funnier is for me. Until frustration find me, of course. I love action figures shots as well as LEGO one, i only choose the second because it fits better with my needs. Needs another podcast that’s a round table debate with more photographers, base on the comments here. Looks like a hornet’s nest has been stirred! This feels like a PC vs Mac thing. And just like my views on computer platforms is to use whatever suits your needs, use whatever figures that will serve the story. Never say never to any kind of toy, cause they each have their own strengths and weaknesses. I think introducing a topic like this encourages divisiveness and should only be done tongue-in-cheek by experts on both the subject and photography so the audience can learn something from it. It also excludes HO photographers, Funko photographers, etc so there’s really no win in having this type of “debate”, especially on a blog that welcomes all toy photographers. Sunny I couldn’t have said it better. Use the toy best suited to tell the story that you want to tell. All the problems mentioned in the podcast about scale, lighting, lenses, practice effects, etc….those are simply challenges to solved. After reading some of the comments here I was expecting a total lambasting of LEGO, and then I listened to the podcast. I’m not really sure why some here have been so critical of this podcast. I took this as two guys chatting about their perceived differences between LEGO and action figures, some subjective and some objective, but I thought both of you presented it really well in an engaging, knowledgeable manner. You gave your opinions on the positives as well as the negatives of both. And Dave DID talk about limitations leading to growth. I didn’t come away feeling like one was better than the other, or that LEGO was being bashed – just that both types of toys had pretty glaring differences (which they obviously do) and that would affect how you approached them, which is absolutely true. Perhaps I didn’t take such offense to it because I’m not strictly a LEGO photographer, but even if I was I doubt I would have seen it as the take-down some here have. I also think that some of the harsher comments are reasons why some might shy away from guest posting/speaking or sharing opinions here. I actually found some of the comments to be the most disappointing part of this. I am definitely in the camp of storytelling first and foremost. I photograph primarily action figures, but have created fun images using LEGO, Hot Wheels, dolls, Funko, adorable little Shopkins toys, even UNO cards and Scrabble tiles (talk about lack of articulation!). Speaking for myself, as I am assuming you are referring to my comments, I admit coming into the podcast after reading the first few comments which colored my perception. The podcast’s original title of “LEGO vs Action Figures” or something combative like that also certainly suggested pitting one camp against the other and personally, I find those to be tiresome and cheap. Changing the name of the podcast does a much better job in perceiving its contents as a revisiting of toy preferences and helps calm things down. It does however, make many of our comments look much ado about nothing so I’m here to make a supplemental comment. My previous comment was to intended to show that it’s usually the photographer’s own limitations rather than the toy itself. My own feeling is that if you have a preference for one kind of toy over another, that’s cool. There’s no need to make head-to-head competitions out of everything. I’ve only mentioned that I don’t like the kind of action figure photography that seeks to copy CGI movies. I find those boring, in the same way I find LEGO photography that is all about the bokeh boring too. It’s not the toy but more what is being done with it. Anna, I was responding to all of the negative comments in general, which I thought was undeserved. And I agree, permission to bash this podcast was given early on. I did not perceive this to be a head to head competition at all. Admittedly though, I came to this post after the title was changed. But even so, there are two meanings to “Vs” – I would have just assumed it was the one that meant “in contrast to” or “as the alternative of.” But I’m not sure what the actual intent was. For sure you and I agree on a couple things (and probably much more than that!) – that it is usually the photographer’s own limitation rather than the toy itself, and that it’s not the toy but what is being done with it. I’m sort of with you on not loving images that recreate stills from movies, but if that’s what a person enjoys then more power to them – there’s enough room for everyone. And often times, if it’s done well, I can appreciate the time and skill that went into that. But for me, more than anything else, I want an image to make me feel something, to make me laugh, to make me think. I don’t want to see a beautifully executed image with nothing to say…that’s like a snack with empty calories. Initially it tastes all right, but it does little for you and is instantly forgettable. I’d much rather see a technically deficient image with something interesting to say. But that’s just me. Anyways, thanks for your response – I do understand your viewpoint.